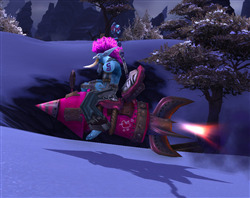 This mount has a very low chance to drop from the Heart-Shaped Box which is rewarded a maximum of once a day for defeating the Crown Chemical Co. Apothecaries boss during the Love is in the Air holiday. Anecdotally, this seems to be the rarest of all the holiday mounts. Having killed this boss every day during the holiday for several years on a handful of alts, I have never received one myself nor seen it drop for anyone else. In fact, I know of only two players on my [medium population] server who have one. i ran it first time on the start of the event on my main and got it.i didnt believe it and thought they may have upped the drop rate.i have been playing since wrath but didnt start running the event dungeon till end of cata so a few years and i only ran it on my main. Unfortunately, the drop rate has not been changed from 0.03-0.04%; you were just fortunate. Congratulations on the mount, by the way!